Welcome back, Arrowheads! So things are getting a bit complicated, with everyone doing their own white lies. 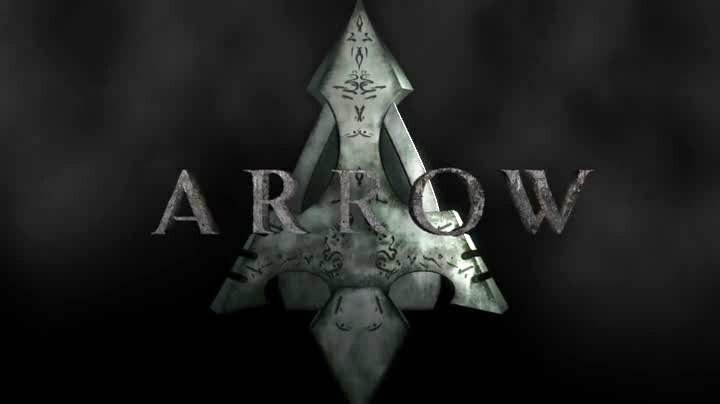 Thea is using Malcolm Merlyn’s money to buy back the Verdant and a killer apartment for her and Ollie to be roomies in, but is neglecting to mention her secret training with Malcolm. Laurel is training with boxer Ted Grant to deal with her anger issues, but is not telling her dad that Sara is dead. And then there’s Roy, who has been having some sleep trouble, probably related to him dreaming she killed Sara! But did he? And if he did, why? “Guilty”. Roy’s not quite in the game as Team Arrow prepares to hit an arms sale to a local gang. Turns out he didn’t need to be, as it seems no one has left the warehouse the sale is happening in. The Team looks and finds all the people at the meet strung up and dead, and a large “GUILTY” drawn in blood onto the floor. One of the gang members is alive, saying “Paco” is missing. At HQ, Ollie relieves Roy to get some sleep while he shakes down some gangbangers for “Paco”‘s whereabouts. Felicity rings up “Paco”‘s cellphone GPS, which leads him to a gym, where “Paco” is strung up with another bloody “GUILTY”. And then, Ted and Laurel show up. Yep, someone dumped a corpse in Ted’s gym! But since both of them left the gym earlier and been having Korean tacos since, then who strung up “Paco”? Someone knows I like the new U2 album? My hipster cred is in jeopardy! Suspicions. While Ollie’s not happy about Laurel training with Ted (and that strung up body’s not improving that), Roy wants Felicity to run a blood test on him for any trace of Mirakuru. Once that’s done and it seems he’s Mirakuru-free, he tells her about those odd Sara-killing dreams, and she points out something odd. Sara’s arrow wounds weren’t caused by any archer, but something or someone with a lot of physical force. Well, let’s leave that for the moment, as Ollie decides to trail Ted, which leads him to a storage locker…with another strung up body! Ted shows up, and they have a scuffle, which ends with Ted claiming to be innocent. His defense? Once, he was a vigilante. Wildcat. About six years ago, Ted was a vigilante cleaning up the Glades, until a drug dealer he roughed up died (which is not entirely accurate). Someone is setting up Ted, but he seems to not know who. After meeting with Laurel about what to do (and to once again, let Laurel know she picked a bad sparring partner), Arrow and Ted head to the nightclub owned by this newest victim…which is the same nightclub where that drug dealer was killed six years ago! And when they get there, more dead bodies are there, along with a masked man blaming all of this on Ted. The masked man escapes, and Ted gets left holding the bag for more dead bodies. This is what we call a “bad night” for Ted. Inconclusive. Back at HQ, Ollie talks to Laurel about getting Ted to reveal this mystery killer, since they seem to be acquainted. But before that, Roy has some wonderful news: he killed Sara! Oops, that’s bad news. Everyone takes that news pretty well (even after hearing Roy’s possible Mirakuru-powered burn off is a working theory), and even Diggle suggests cutting Roy loose because, you know, rules about killing fellow vigilantes and stuff. Laurel, understandably a bit rocked by this news, confronts Ted in holding about the mystery man (and remind him he’ll probably get released once they figure out Ted has an alibi). The mystery man is Isaac, Ted’s former partner in fighting crime, who was the one who was responsible for that drug dealer’s death. Well, that explains “who”, but why all the killings to frame Ted? Well, guess who stops by to kidnap Ted and Laurel as they leave the police station and tell us all that? The Problem With Partners. With both Ted and Laurel being held hostage in a car by Isaac, Laurel quietly dials Arrow HQ and the team springs into action. Isaac talks about how Ted abandoning him led to all kinds of bad stuff happening to him and now he wanted to seek revenge against his former mentor. Arrow and Diggle get unlucky trying to stop the car, and Roy pops up to help out. Ted and Laurel manage to kick Isaac out of the car, but before the car crashes and catches on fire. While Arrow and Diggle get those two out of the car, Isaac fights Roy, and tries to scare him with talk about just being “a weapon in (Arrow’s) arsenal” (hey, I smell a nice hero name there! ), but gets defeated. Roy asks Ollie not to abandon him, and Ollie agrees. But what about Sara? Hidden Truths. After talking to Laurel and Ted on their own about why this sparring thing is a mistake (and surprise, they still agree to spar afterwards), Laurel asks about Roy? Ollie has an idea: that same meditation thing he did in Hong Kong, but Roy should do it. And then we learn the truth: Sara’s death trigger the actual memory he was blocking but was seeping into his dreams, namely that cop he murdered while OD’d on Mirakuru last season. So good news, he didn’t kill Sara; but bad news, Roy’s upset because he found out he killed a cop. So, yay? Meanwhile, Isaac’s being escorted out of police HQ in chains when the guards are struck down with arrows. Wha, who? Isaac asks who this person is, and its a redhead with a bow and arrow. She answers, “I’m Cupid, stupid.” We’ll take your word for it. –Comic book connections: We’ve already mentioned Ted Grant as hero Wildcat previously, and as for this Cupid lady? More on her next episode, but she’s a recent addition to Green Arrow’s villains gallery. 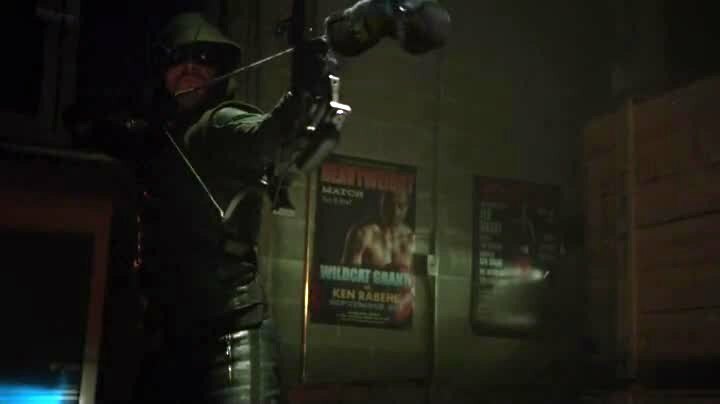 –We got a makeshift boxing glove arrow! We hit the show’s apex, people! –“Stenography” is not a dinosaur with plates on his back. –Rewatching the episode, I just realized that this Cupid lady is in every crowd looking at the crime scenes. Nice way she’s buried in there, if it wasn’t for the striking red hair, you wouldn’t be able to tell. 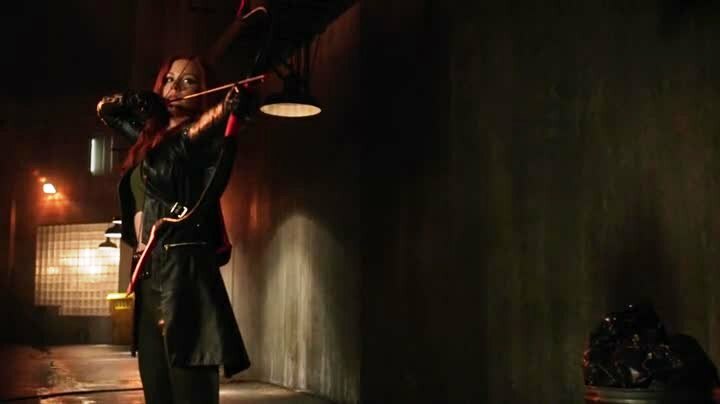 –For those of you wondering if Laurel’s training pays off, you probably didn’t see that photo that got released this week of Laurel in a particular outfit. That look is growing on me is all I’ll say. ← A little John Barrowman is good for the soul.